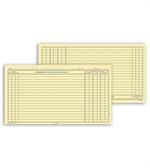 5Forms Business Checks & Forms > Healthcare Products > 1140 Continuation Exam Records Card Style with Account Record 5 X 8"
Back of form features space to list services provided and fees charged for accurate record-keeping and billing. Shrinkwrapped in 50 per pack. 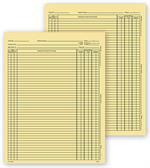 H153 Continuation Exam Records Single Sheet 4 1/2 x 8"
H1530 Continuation Exam Records Folder Style 9 1/2 x 8"
H1532 Continuation Exam Records Letter with Account Record 8 1/4 x 10 3/4"
$47.88 1140 Continuation Exam Records Card Style with Account Record 5 X 8"